I am heading off to the little festival Blissfields in a weeks time, so this wish list is possibly a tad late for me, however if any of you are off to any festivals here is my guide to your essential beauty and fashion for the few days. 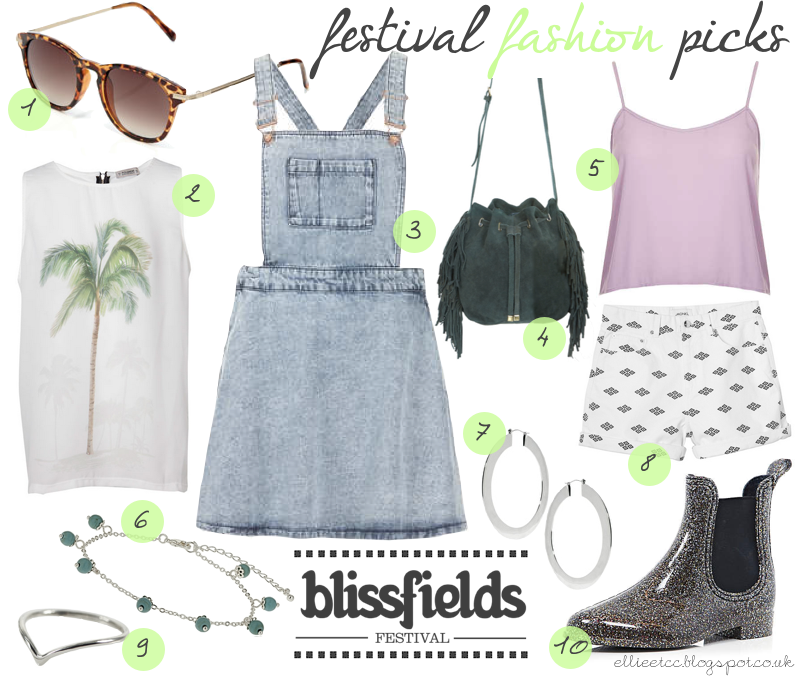 Blissfields is actually a themed festival, this year the theme being 'The Directors Cut', so my wardrobe for the weekend may look a bit different to that on this wish list! This is just a general wishlist, for general festival wear. I also feel it should be a bit more colourful, there are just too many other pieces that I couldn't squeeze in! How cute are the little wellies? They are seriously an essential for any festival! This pair are especially good too because if the weather suddenly decides to brighten up a bit, they won't get all gross and sweaty on your legs like full length wellies do! The little pouch bag is a perfect size to keep your daily essentials (phone, money etc.) in, but not too bulky to be lugging around all day. I'm continuing my love of hoop earrings too, and I also love this cute little anklet (number 6), would look great with any outfit. My absolute favourite out of the whole of this wishlist though, would have to be the denim dungaree/pinafore dress. It reminds me so much of primary school days, but I love the slightly grungy up-to-date acid wash denim fabric of it. I think it would be perfect for any festival goer! I've actually ordered some dungarees but with shorts instead of a skirt, they will debut on my blog as soon as they arrive! What do you think of my picks? Are you going to any festivals this year? Anybody going to Blissfields too? p.s. there is still time before we say goodbye to Google Reader (boo, hiss!) to head over and follow ellie etc on bloglovin HERE to continue seeing updates from my blog.